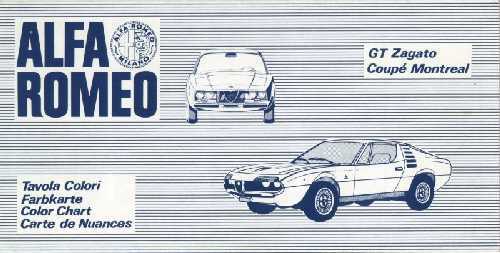 Alfa Romeo Junior Zagato & Montreal Color Chart. 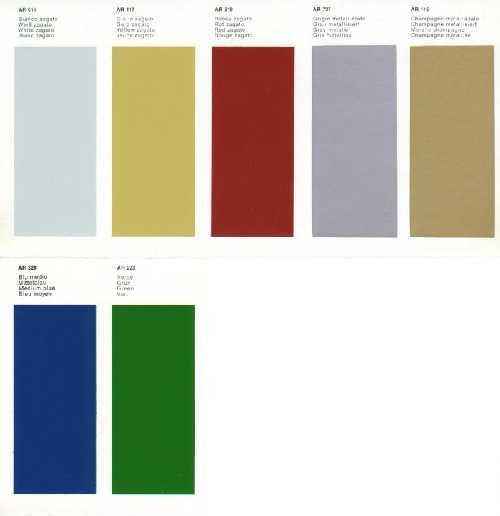 Both the 1300 & 1600 Junior Zagato were available in a wide range of exterior colors. Christian Koopmann kindly provided scans of the ultra rare color chart that he possesses (envy, envy, envy!). Please note that I have removed the color samples for the Montreal, this in order to avoid confusion. Apparently, a difference between the 1300 & 1600 is that the 1300 has been available in black and the 1600 not. However, this is not shown in the color chart at all.